The Alexander Street / University Place Task Force spent 2013 examining ways to upgrade transit accessibility along Alexander Street in the light of Princeton University’s decision to build new University facilities on the site of the track for the Dinky railroad. Their report, expected some time this year, is likely to have broad implications for traffic and transit in Princeton. Some of the possibilities the joint University-Town committee has been examining include a new streetcar, and a one-way system for cars in downtown Princeton. New Jersey Department of Transportation seem determined to close the jughandles that route traffic into Princeton from Route 1 at Washington Road and Harrison Street. Their last effort, in 2012, caused uproar and was canceled. But behind the scenes, NJDOT have been meeting to figure out a different road layout that will increase the flow of cars driving along Route 1 past Princeton and West Windsor. Expect something new to emerge sometime this year- and let’s hope that it helps to make it easier and safer for walkers and cyclists. The Princeton Planning Board are expected to consider new zoning for Witherspoon Street between Nassau Street and Valley Road. Considering the whole street at once offers the potential to make forward-thinking plans for shared resources and increased harmony of surrounding buildings and uses. The plan could be extremely important for upgrading a key corridor which is currently a bit of a mess and which has been the site for several big changes, including the redevelopment of the old hospital. Local architect Bob Hillier has presented his own plan for harmonizing zoning along Witherspoon Street, and is likely to bring many useful ideas to the table. Council member Lance Liverman has been chairing a task force looking at ways to increase space at the Mercer Engine Company No. 3 firehouse, where Princeton’s three fire companies now operate from. His report, which could drop any day now, is likely to recommend using some of the old Valley Road School site at 369 Witherspoon Street for expanded operations. Princeton First Aid and Rescue Service could join the firefighters on the site, leaving their current operations base at Harrison Street. Various court cases about local development issues are being waged by local residents, and are likely to be adjudicated this year. Court cases to reverse Princeton University’s move of the Dinky station are ongoing. The Institute for Advanced Study is defending its plan to build faculty housing on a site considered by some to be a key part of the Princeton Battleground site. A new group is suing the town because they are unhappy about the decision to approve the AvalonBay apartments plan at the old hospital site. Two other resident groups are waging court battles about property taxation: one which aims to force the University to pay more tax on their currently tax-free holdings, and another which is fighting the town’s property tax revaluation from 2010. The major outcome is likely to be that the plaintiffs will end up angry and lawyers will end up rich. No surprises about the idea that Christie will take a run for the Presidency. But who will replace the big man at Drumthwacket? Christie got a landslide reelection win in 2012 but his policies on transit and affordable housing have left a lot to be desired. A new governor might do more to break down the barriers which make New Jersey one of the most segregated states in terms of economics, and lead investment in transit to reduce the overwhelming concentration of cars. Let’s hope some worthwhile candidates come forward. Princeton was awarded Bronze Bike Friendly status in 2012- a decision which raised a few eyebrows, but which reflects growing organization among municipal officials dealing with cyclists’ issues. 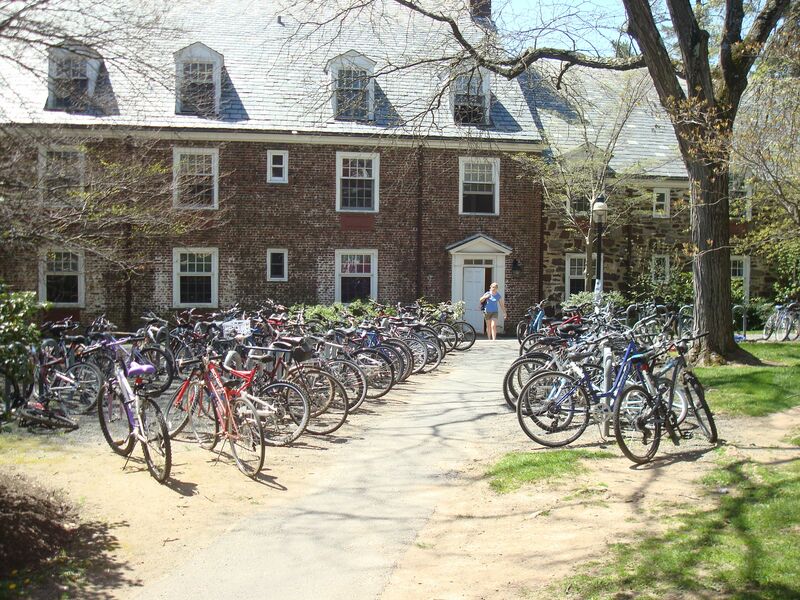 Expect Princeton to do more to promote cycling in 2014, including mass cycling events at Pi Day on March 14, and at an inaugural Princeton Ciclovia on May 4. Princeton has a new School Board superintendent as of Jan 1 in Stephen Cochrane. The town will also get a new municipal lawyer in 2014, as longtime attorney Ed Schmierer is retiring. Meanwhile, Bob Bruschi, the long-standing municipal administrator is poised to retire. Although Bruschi decided to extend his tenure in December 2013, he may very well take his gold watch in 2014. Deputy Adminstrator Kathy Monzo has been groomed for the position, but if she gets it, expect to hear grumbling because of perceived irregularities regarding the appointment of her daughters to municipal jobs. But there may be change beyond that. Council President Bernie Miller will see his term expire at the end of 2014, and there has been talk that he might call it a day after a long career in Princeton politics. Who might replace him? The new Council Member will be chosen by the notoriously-factional Princeton Community Democrat Organization, and we can bet that behind the scenes potential candidates are already jockeying for the slot. Likely candidates could include former Borough stalwarts Roger Martindell, Kevin Wilkes, and Yina Moore, who unsuccessfully sought office in 2012. But would any of them have the foresight to promote affordable, walkable housing in town? Last year, a planned law called Assembly Bill 2586, which would exempt private universities and colleges from local planning jurisdiction was shelved. Currently, public universities in New Jersey (such as Rutgers) do not have to apply for planning permission for their developments, a privilege which enables them to build the facilities they require without being blocked by opposition from local residents. A-2586 would give private educational establishments (such as Princeton University) the same right. That might allow Princeton University to build whatever they liked on their land- which includes much of the town. The bill was strongly opposed by local mayors- but don’t be surprised if, zombie-like, the A-2586 bill comes back under legislative scrutiny sometime this year. 10. Princeton Housing Will Get More Expensive. Traffic Will Get Worse. Princeton has made no effort to expand the pool of affordable and reasonably-priced housing that could reasonably be argued to be commensurate to the problem. As such, Princeton housing will get even more expensive, and the trend of middle-class people living elsewhere and driving their cars into Princeton every day will continue. Princeton could fix this by reforming the Housing Element of the Masterplan to expand the supply of homes that moderate-income people could reasonably hope to live in. Instead, it looks like Council will go down the disastrous path of setting up ‘Advisory Neighborhood Planning Districts’, which will pit different Princeton neighborhoods against each other in an effort to build the least amount of anything. The last thing Princeton needs is to make it even harder to build affordable homes, so let’s hope this plan gets kicked to the curb. What do you think of our predictions? Which of these do you hope will come true? What other things do you expect in the coming year? Have your say in the comments section below! This entry was posted in Affordability, Alternative Transportation, Biking, Community, Complete Streets, Density, Downtown Vibrancy, Local, People, Placemaking, Princeton, Smart Growth, Sustainability, Traffic, Transit, Zoning and tagged Institute for Advanced Study, New Jersey, Princeton, Princeton University. Bookmark the permalink.